YouTube VR is one of the best reasons to use Google’s Daydream VR platform, but the company didn’t make it available for higher-end PC headsets. That’s just ended with the release of a Steam VR version designed for the HTC Vive. It’s available to download right now. I’d love to tell you how it is, but for some reason it doesn’t work on my PC — it crashes instantly on start, and a lot of people in the Steam forums are having the same problem. A member of the dev team has responded to the thread and is looking into the issue. Google has released YouTube VR in Steam Early Access, to be fair, indicating that bugs are to be expected. But having the app not work at all for what seems to be a significant proportion of the userbase is an unfortunate slipup — especially considering how good Google Earth is on the Vive. Still, at least the app is free, so there’s no reason not to try your luck. If you were using sites like Netflix, Spotify, Twitter, Reddit, and Amazon in October 2016, you may recall these and other services going down for a while in the middle of the month. The cause was one of those pesky distributed denial of service (DDoS) attacks, and this week a U.S.-based man admitted to creating the hugely disruptive botnet that made it happen. Paras Jha, 21, of Fanwood, New Jersey, this week pleaded guilty in a New Jersey court to violating the Computer Fraud & Abuse Act when he created the Mirai malware. Mirai infected more than 300,000 connected devices globally and was used in multiple DDoS attacks on various online services carried out by Jha and others. As we mentioned at the start, the most significant attack using Mirai struck popular online services in October 2016. The botnet targeted data centers operated by Dyn, a company providing internet traffic management and optimization services for many high-profile sites. When the DDoS attack was in full swing, internet users were unable to access web addresses assigned to sites serviced by Dyn, causing huge disruption and frustration in the process. Jha isn’t accused of any direct involvement in the Dyn attack, which could have been carried out by others after he posted the Mirai code on online forums in September or October 2016, apparently in a bid to make it harder for law enforcement to trace the botnet’s origin back to him. But Jha did carry out his own DDoS attacks using Mirai, including on Rutger University, where he had been a computer science student. The website of well-known cybersecurity expert Brian Krebs was also knocked offline for several days by Mirai, prompting Krebs to undertake a meticulous investigation that led him to identify Jha as the possible perpetrator behind the damaging botnet. Two other men, Josiah White and Dalton Norman, also entered guilty pleas for using the botnet for criminal gain. White told the authorities he modified Mirai’s code so it could more effectively identify vulnerable connected devices, among them webcams and baby monitors, before infecting them to increase the power of the botnet. Norman also used his knowledge to help further increase Mirai’s reach and effectiveness. Jha’s plea agreement reveals that he created Mirai’s code some time around July 2016. He also rented Mirai to others, and even set up a company with White to help rescue businesses affected by the botnet, “like firemen getting paid to put out the fires they started,” as Krebs put it. Jha could face a maximum of 10 years in prison and a fine of $250,000 when he’s sentenced in March 2018. Google has always had a rocky relationship with China. The search engine is banned in the country, along with its app store, email and cloud services, but that hasn’t stopped the company from maintaining some level of presence with its international workforce. And that presence is set to grow following the announcement that Google is setting up an AI research center in Beijing. The facility will, according to Google, be the first of its kind in Asia, made up of a small team working on basic AI research from an existing office. The company seems keen to attract the best people to the department, noting that it’s already hired some “top experts” and will be working to build the team in the months ahead. There’s certainly no shortage of talent in the country, but Google will be competing with the likes of Baidu, Tencent and Alibaba for it, not to mention rapidly-expanding startups such as SenseTime and Face++, which also place a deep emphasis on AI work. The announcement isn’t a sign that Google will be launching new services in China — or even rolling out its existing ones — any time soon (although earlier this year it was allowed to make its Google Translate app available in the country as well as hold a Go tournamentin eastern China), but does demonstrate China’s appetite for research and development. As Google’s chief AI scientist Fei-Fei Li said in the announcement blog post, “the science of AI has no borders, neither do its benefits”. Synaptics, the company responsible for handling the touch input on millions of laptop trackpads and smartphone screens, has announced this week that it’s entered mass production with its first optical in-display fingerprint sensors. Titled Clear ID, these are expected to work exactly like the home button fingerprint sensors you might have known on Samsung’s flagship Galaxy S phones before this year’s Galaxy S8 and on Apple’s iPhones before the latest iPhone X. Only they’ll be more magical because you’ll be able to authenticate by pressing on the actual display part of the touchscreen. It was exactly a year ago today that Synaptics first announced its FS9100 optical fingerprint sensor “family.” At the time, it was merely a technological breakthrough — more a statement of intent than a forthcoming real-world product — and subsequent events have shown that there were issues with the implementation of that tech, which reportedly forced Samsung into a last-minute change with its flagship Galaxy smartphone. Samsung wanted to have a bezel-free front on its phones without losing the front-facing biometric ID function, however the integration of the optical fingerprint reader didn’t go to plan and Samsung had to put in an awkwardly-placed fingerprint sensor on the rear of its 2017 flagships. Today’s FS9500 Clear ID, on the other hand, is going into full production with what Synaptics describes as “a top five OEM,” meaning it’s either Apple, Samsung, Huawei, Oppo / Vivo, or Xiaomi. Synaptics’ prior history of working with Samsung and the specific callout of “OLED infinity displays” in Synaptics’ press release (Samsung calls its bezel-less Galaxy S8 and Note 8 screens “infinity displays”) would suggest the two companies might once again be working on solving the seeming intractable issues of 2017. Then again, Samsung was reported to be moving away from Synaptics this summer, so nothing can be known for sure. Xiaomi is certainly a good candidate to be the mysterious OEM partner, given how much it loves to embrace new tech early and its history of bezel-less flagships with the Mi Mix line. Whichever company might be partnering with Synaptics now, it’s almost certain that more will follow as 2018 goes along. There’s a definite futuristic quality to being able to authenticate directly through the display, and UI designers would also find it easier to explain the function to neophyte users — so the demand and appreciation for this kind of technology is already out there. It was supposed to be one of the highlight features of 2017 flagships, but now that the kinks seem to have been ironed out, the promise is shaping up to finally come to fruition next year. Thanks to the convenience of smartphones, snapping photos has become second nature. Anyone can grab a phone and take as many pics as they want. Even more convenient is the fact that you can instantly see what the photos look like. If you took a bad one, you just delete it and move on. However, as strange as it might sound, there’s an increasingly popular app that mimics the use of old film cameras by making you wait three days to “develop” your photos. The 99-cent app is called Gudak Cam and has become very popular in South Korea and Japan, especially among high school girls. The app came out earlier this year, and is meant to simulate the look and feel of using a Kodak disposable camera (remember those?). The app requires you to fill up a “roll of film,” which contains 24 shots. Once you’ve finished with that roll, you can have it developed in a process that takes three days, at the end of which you can view the photos on your phone. With Gudak Cam, you will also have to wait several hours before you can add a new roll of film to your virtual camera. All of this may sound incredibly inconvenient and, to a large extent, it is. However, the appeal of Gudak Cam lies in the fact that it forces users to slow down and really think about each shot. Rather than snapping half a dozen pictures and only keeping one, the idea is that users will slow take a handful of really good pictures that are worth keeping. Beyond that, the app’s aesthetics do a lot to help explain its appeal. Once the app is active, an image reminiscent of Kodak disposables fills the screen, giving you the feeling that you’re truly holding one of these ancient devices. Even the method to shoot photos is changed — you have to use the app’s small viewfinder. All of this combines to create an experience that is quite different from using the standard camera app on a smartphone. Whether Gudak is just a passing fad or the start of something bigger remains to be seen. However, it already has more than 1.3 million users, so it seems to be doing something right. That being said, if you want something more modern than check out our list of best cameras of 2017 or the best camera phones if you prefer something smaller. The trailer didn’t give too much away in terms of plot, but the title is Into the Spider-Verseand it features the tagline: “Enter a universe where more than one wears the mask.” While Morales might be the main protagonist of this movie, it is looking like we’ll be meeting multiple Spider-Men in the course of Morales’ journey. Since World War II, Japan has struggled with a work culture that consists of excessive overtime. To curb that behavior, one firm is planning to use drones that fly around the office blasting Auld Lang Syne to get employees to realize it’s time to go home. The system, developed by office security and cleaning firm Taisei and telecom giant NTT, will see drones patrolling the office on a scheduled flight path. The drones will also record footages of what they see during the flight to identify employees who remain in the office after standard work hours. “You can’t really work when you think ‘it’s coming over any time now,’” Taisei director Norihiro Kato told The Japan Times. Auld Lang Syne is typically played in Japanese malls to announce that stores are closing. Taisei will trial the system in April 2018, targeting a monthly fee of ¥50,000 ($450) for companies to use this service. However, some experts say this is unlikely to solve the root problem. Overworking in Japan is the cause of thousands of deaths in Japan annually — so much so that Japan has a word to describe this particular type of mortality: karoshi. A whitepaper released last year found that one in five Japanese work an average of 49 hours or longer each week, with most karoshi victims in their 30s and 40s. The victims die from various illnesses, such as heart failure, exhaustion, stroke, starvation, or suicide as a result of work stress and depression. Google Cloud Next ’18 is coming! Mark your calendars for July 24-27, 2018 at Moscone Center in San Francisco. Google Cloud Next is where customers, partners, developers, influencers and the greater global cloud community get inspired and learn. Together, we’re working to make the cloud useful and accessible to everyone. Dive deep into Google Cloud technology through hundreds of breakout sessions, code labs, demos and hands-on training, covering everything from infrastructure to devices, and security to machine learning. You’ll get the chance to connect with the entire Google Cloud team, including our engineers, product leadership, developer advocates and more to unlock new opportunities for your business. At Next ’17, more than 250 Google speakers and 70+ customer speakers presented at 200 breakout sessions. We made 100 announcements at Next ’17, and we’re gearing up for more big news next year. Next ’18 will feature tracks that encompass all aspects of our Google Cloud portfolio: application development, containerization, collaboration & productivity, data & analytics, infrastructure & operations, hybrid cloud, machine learning & artificial intelligence, maps, security, mobility & devices and much more. Be on the lookout for information on how to register coming in March 2018. Know someone we can all learn from, or want to contribute yourself? We’re actively soliciting proposals for speaking sessions that will educate and engage attendees. If you have an interesting idea or expertise that you would like to share at Next ’18, please submit your proposal by January 26, 2018. The earlier the better. We’re excited to create an inclusive space that brings people together, fosters collaboration and inspires innovation at Next ’18. We can’t wait to see you in July! Who says construction can’t be fashionable and fashion can’t be sustainable? A new project by 3D-printing company Ai Build and luxury fashion brand Bottletop has recently launched in London, where the brand’s flagship brick and mortar store was finished using robotic fabrication and recycled materials. The interior of the 3D-printed store was created using filament from Reflow, an “ink” provider whose filament is entirely upcycled from plastic waste. The project serves as an example for how construction and fashion can combine in sustainable ways, without turning their backs on beautiful design. Ai Build has made waves in the past with its construction of sophisticated structures, meticulously built using Kuka robots and machine vision algorithms. Last year, the London-based startup revealed its “Daedalus Pavilion” at a conference in Amsterdam. The 350-pound structure consisted of 48 individual parts, yet took a surprisingly brief fifteen days to print. Now Cam and his team have taken their penchant for design to the fashion industry by partnering with Bottletop, a fashion company that crafts their goods out of upcycled materials — yes, including bottletops — instilling sustainable values into a traditionally unsustainable industry. To be sure, the Bottletop store wasn’t completely 3D printed, like the proposed office space in Dubai, but by using recycled materials the project manages to make an impact in its own right. 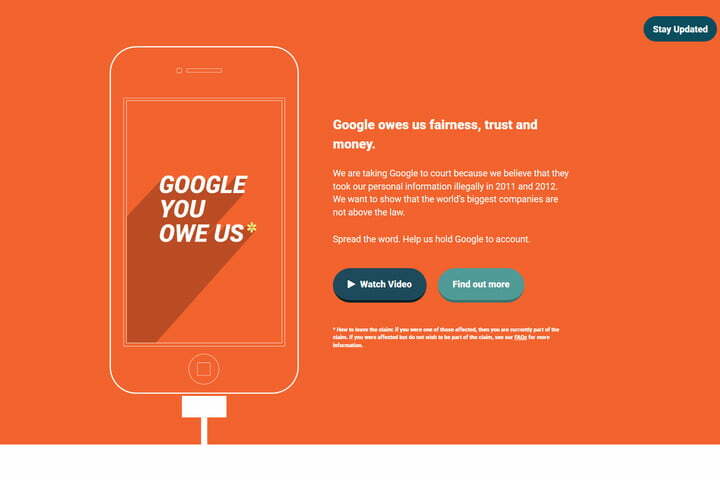 A campaign group in the United Kingdom is pressing forward with its lawsuit that claims Google owes a payout to everyone who used an iPhone between 2011 and 2012, because of Google’s data gathering techniques on the Apple browser Safari. The group, “Google, You Owe Us,” accuses Google of bypassing security restrictions on the Safari browser on iPhone devices to gather personal data, while insisting to users that it was not able to do so. The group claims that this bypass, known as the “Safari Workaround” was used to sell personal data from the 5.5 million iPhone users in the U.K.
Google has denied that the claims are valid, and holds that the breach was not serious enough to break each users’ human rights, and should have originally been tried in California. Richard Lloyd, former director of product-review company Which is representing the iPhone users, and told BBC Radio 4’s Today program that “Google and similar tech giants from Silicon Valley are behaving as if they are above the law,” and beseeched the courts to allow him to hold Google to account for their deception. Legal firm Mishcon de Reya has agreed to represent the group at court, and agreed that data was a “valuable new currency,” and consumers rights would need to be upheld, and new systems to police them would need to be established. This is hardly the first time that one of Silicone Valley’s tech giants has been sued over misuse of data. In 2011, Apple were sued for tracking US iPhone users without permission, after the iOS 4 update enabled location tracking in the background. This particular case against Google dates back to 2015, after the same campaign group won the right to sue Google over this particular breach of privacy. Issues with the “Safari Workaround” date back even further than that, with Google having previously settled out of court with U.S. state attorneys for $17 million in November 2013, and paid a $22.5 million fine to the Federal Trade Commission in August 2012 after the FTC decided that Google had misrepresented its stance on tracking to the Safari users. This case is thought to be the first of its kind in the U.K., and hopes to win 1 billion British pounds ($1.35 billion) for the Apple customers affected by the data breach, and is expected to go to the British courts in 2018.